Fiscal Year 2013 continues.We now have three month’s worth of CPI-W data, but what it means at this point is indeterminable. Whether or not there is a COLA for January 2013 will depend on what happens with the CPI-W from July 2012 through September 2012. The baseline level (my term for it,) which was the amount which determined the amount of the 2012 COLA, is 223.233. 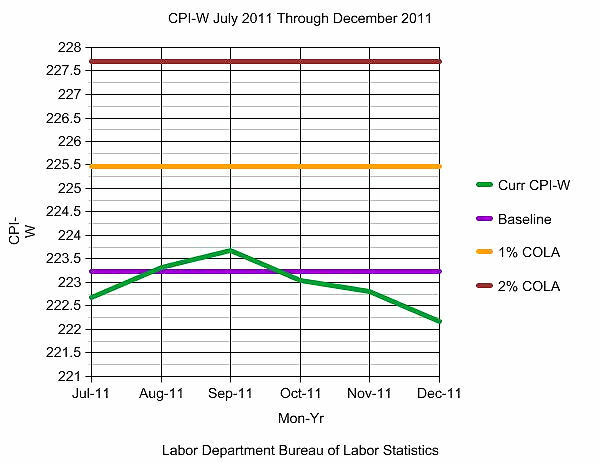 This was the average CPI-W for July through September 2011. We will need to exceed this amount in order to receive a COLA in 2013. At the present time, prospects don’t look so favorable for a 2013 COLA. According to the Department of Labor, Bureau of Labor Statistics (BLS) the CPI-W dropped 0.3% in December from what it was in November. To remind everyone, the October CPI-W dropped from September. Here it is in graph form. For a 1% COLA, the July 2012 through September 2012 CPI-W average would have to be 225.465. For a 2% COLA, the July 2012 through September 2012 CPI-W average would have to be 227.698. These amounts, along with the baseline amount, are shown on the graph. Note: These remarks refer to the CPI-U, which is the index for all urban consumers. It includes about 86% of the population. The CPI-W is a subset of the CPI-U. It contains only about 37% of the population, and is widely considered to be less representative of the expenses of Social Security beneficiaries. Similar to last month, the energy index declined in December and offset increases in other indexes. The gasoline index declined for the third month in a row and the household energy index declined as well. The food index rose in December, with the index for food at home turning up after declining last month. For more information, please refer to Consumer Price Index Summary. This entry was posted in 2013 COLA Watch. Bookmark the permalink. I don’t see, or can’t find continuing update reports for Jan and Feb. Have you stopped issuing these, or where can I find them?